Choose from a variety of scheduled departures which coincide with the best wildlife viewing season or ask the Traveljoy specialists to tailor-make a package especially for you. Guided, personalised group tours can be arranged for clubs, families and friends. Add optional extensions, rail packages, stopovers and more to suit. Awake your senses in unspoilt Africa on a small group safari…Breath in the smell of nature, take in the sights of exquisite wildlife on open game drives and river cruises, be one with nature, hear the sounds of tribal Africa all on a fully guided small group safari with Traveljoy. 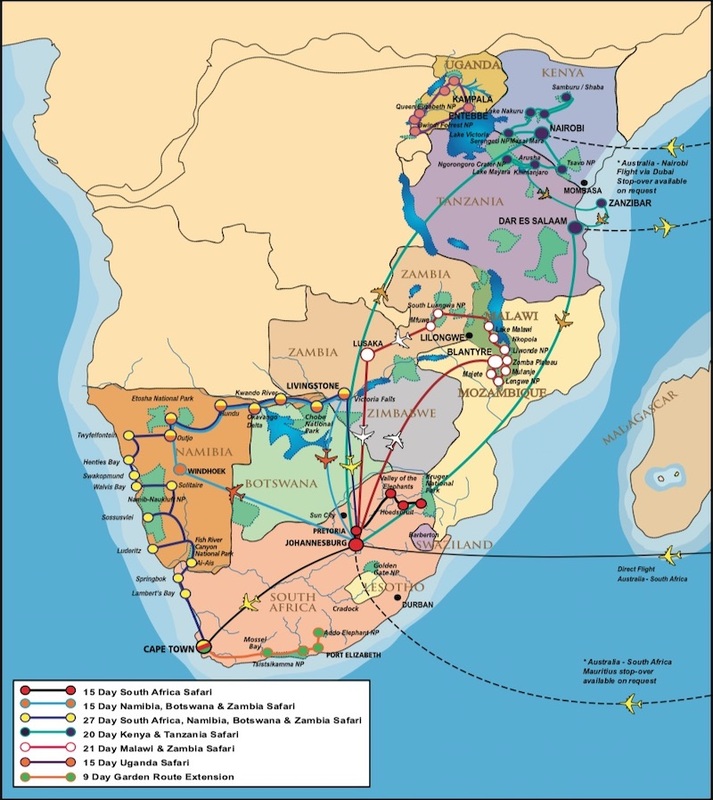 Explore South Africa, Botswana, Namibia, Zambia, Kenya, Tanzania, Malawi, Rwanda, Uganda or choose a special extension. Experienced qualified guides will share the wonders of Africa, its amazing wildlife, natural beauty, friendly people, fascinating cultures and history. Africa will make you feel alive! African safari specialist, Traveljoy, presents a variety of African adventures for you to choose from. Traveljoy offers a wide range of tour packages from a short 3 night excursion to an incredible 61 day near fully inclusive experience. Whichever package you chose, you can rest assured that you have selected a proudly Australian-owned safari company that is dedicated to providing you with the best holiday experience yet. Traveljoy's experienced and qualified guides have an intimate knowledge of the various countries featured. They are flexible and will do their best to cater for individual needs and comfort of each traveller. Traveljoy tours and safaris are safe and secure, and guarantee excellent value for money. All packages include airfares, accommodation, personal guides, park entry fees, activities and most meals – they are hassle-free with no hidden costs. With an emphasis on smaller groups, Traveljoy has chosen warm, inviting 3–5 star accommodation in a variety of premium lodges and resorts, guest houses, hotels and private game reserves throughout their safaris. Personalised arrangements can be altered to suit. With frequent two or three nights stays incorporated in the itineraries, Traveljoy ensures personal service and great hospitality is experienced allowing you time to absorb the atmosphere. All accommodation has private ensuites – no sharing of bathrooms and no pitching of tents. Optional extensions will be available to add extra excitement. An average of 8 to 16 passengers per tour is usual however on specific departures guest numbers can be capped at 6 for comfort. Transport in Southern Africa is by air-conditioned vehicles, and in East Africa by extended game-viewing 4WD's. 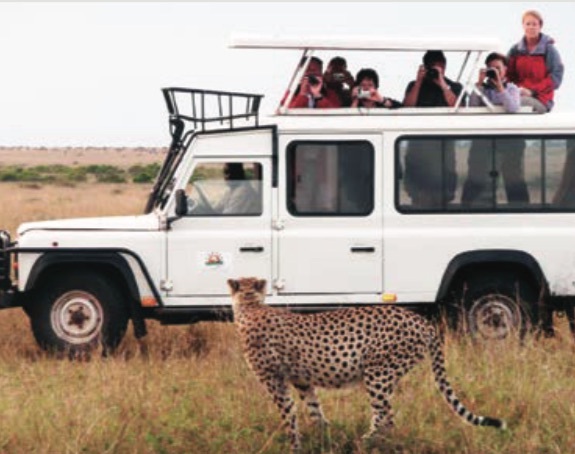 All game drives will be aboard an specialised game viewing 4x4 safari vehicle. Just book a 2019 Traveljoy scheduled safari and purchase travel insurance with Traveljoy to enter the draw – it's that simple. Plus if your deposit is paid by 31 January 2019 you will even receive two entries per person! The Traveljoy team absolutely loves Africa and wants to share the beauty both culturally, scenically and also the mind blowing wild life experiences with you. From the jaw-dropping gentle giants of the mountain gorilla, to the friendly African locals, varied landscapes from mountain tops to wide-open savannahs or vast salt pans, to soaring sand dunes to mighty canyons, roaring Victoria Falls to roaring lions – Africa has something for everyone and Traveljoy is here to help you find it! People who ordered African Guided Safaris also ordered the free travel brochures below. Click on the images to find out more about these brochures.